This one can keep them guessing, my mixed message icon of the day … well, is it friendly? 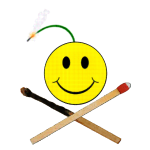 Variation on the skull and crossbones, pirate flag, poison, warning icon. The term itself, “friendly fire” was always a double-edged euphemism in it’s own right.